That's right. You could win up to $600.00 this Tuesday at Sports Cards Plus. BEST PULL in The Month of October WINS $100 at Sports Cards Plus. ---Product must be opened in Store to qualify. ---Best Pull based on eBay Sales - Charlie has final decision. FREE ENTRY TO OUR OCTOBER 31st $500.00 DRAWING matching the amount of your total purchase. We keep pulling tickets until we reach a total of $500. 2017 Topps Five Star Baseball checklist is going all-in with autographs. Arriving Wednesday at Sports Cards Plus, This high-end product returns with a relatively simple set-up and lots of on-card ink. Each 2017 Topps Five Star Baseball ($134.95) box has TWO On-Card Autographs. Base autographs featuring a mix of current, retired and rookie players, all are hard-signed. According to Topps, the checklist here will have quite a bit of depth, reaching 83 players. Base parallels come in Purple (/50 or less), Blue (/25 or less), Green (/15 or less), Gold (/10), Orange (/5) and Red (1/1). 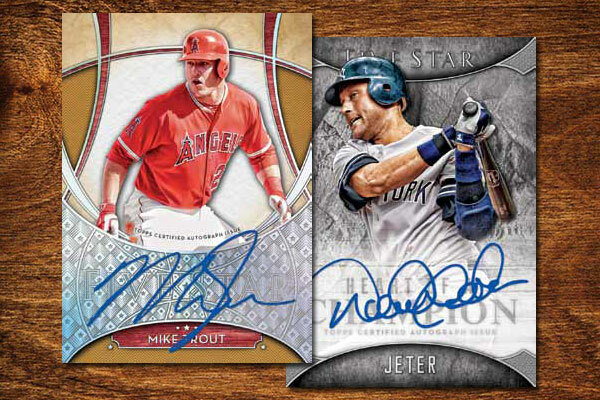 Numbered to 20 or less, Five Star Signatures are significantly tougher pulls. Besides having bigger-name players, some cards come with inscriptions added. Heart of a Champion Autographs spotlight players who created big postseason moments. All are limited to 35 or less and the only parallel, Five Star, is numbered 1/1. Silver Signatures and Golden Graphs get their names for the color of the ink used to sign the cards. Parallels for these come in Purple (/25), Blue (/20), Green (/15), Gold (/10), Orange (/5) and Red (1/1). 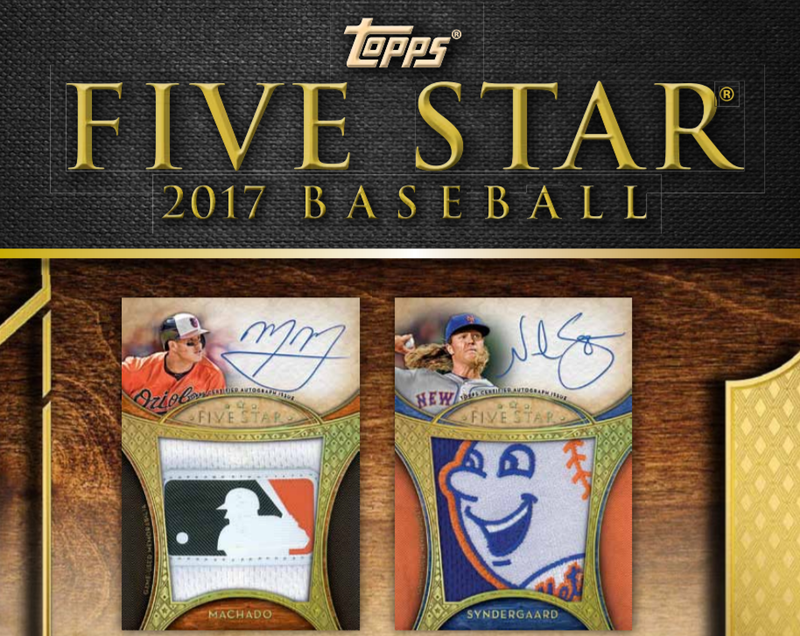 Autographed Jumbo Patch cards are included in 2017 Topps Five Star Baseball. All are numbered and come with over-sized swatches. Parallels include Gold (/25 or less), Silver Rainbow (/10 or less), Team Patch (1/1), Majestic Patch (1/1), MLB Logo Patch (1/1) and Laundry Tag (1/1). Signatures on these are on-card. 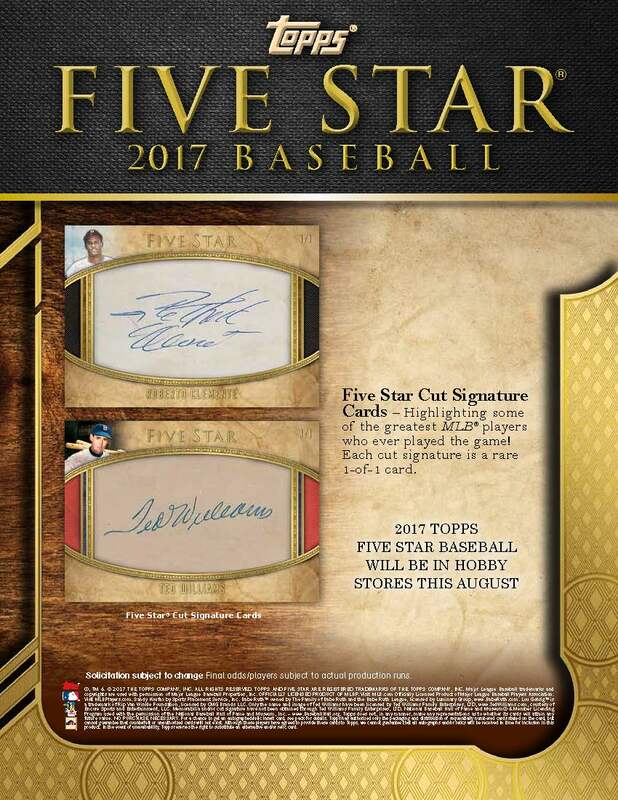 Ninety-nine Cut Signature cards are also in 2017 Topps Five Star Baseball. All of these are one-of-ones.